L-R: Secretary General of the Pacific Islands Forum Secretariat Tuiloma Neroni Slade, Cook Islands Prime Minister Henry Puna, Marshall Islands President Christopher Loeak and Tuvalu Prime Minister Enele Sopoaga are pictured at the opening of the 15-nation Pacific Islands Forum in Majuro on September 3, 2013. 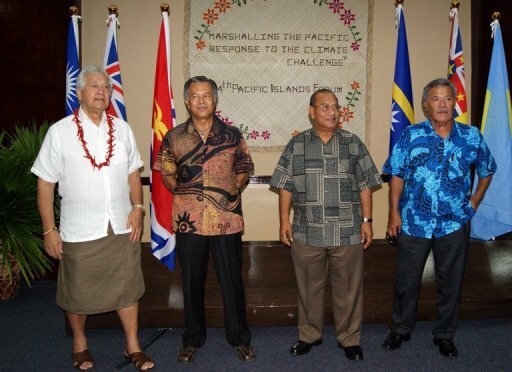 MAJURO, Marshall Islands (AFP) – (AFP) – Pacific leaders whose nations are threatened by climate change on Tuesday opened a regional summit in the Marshall Islands with a challenge to the rest of the world to take action. Leaders of the 15-nation Pacific Islands Forum (PIF) arrived at the summit in the capital Majuro on a flotilla of outrigger canoes and were greeted by warriors in grass skirts performing traditional stick dances. Cook Islands Prime Minister Henry Puna said the theme of this year’s meeting, “marshalling a Pacific response to the climate challenge”, reflected the concerns of a region where some nations face being inundated by rising seas. He said the people of the Pacific felt abandoned by the rest of the world even though they were bearing the brunt of an environmental crisis they had not created. “(It) speaks partly to the frustrations we all felt in the past of being overlooked, ignore and undervalued,” Puna said. The Pacific Islands Forum consists mostly of small islands states, along with resource-rich Papua New Guinea and regional powers Australia and New Zealand. Some of the countries, including host the Marshall Islands, are made up of atolls that barely rise one metre (three feet) above sea level. Marshall Islands President Christopher Loeak said climate change was already affecting his country, which is in the grip of severe drought and was hit by storm surges in June which washed away parts of Majuro’s sea wall, forcing its airport to temporarily close. While there has been some discussion about potential relocation of “climate change refugees” in the face of the advancing seas, Loeak was defiant, saying his people will always remain in their homeland. “To all Marshallese and all the people of the Pacific, my land is my home, my heritage and my identity in ways the English language cannot capture,” he said. “This is my country and I will always stay here. If water comes, it comes.” Loeak hopes to use the summit to revive stalled global efforts to tackle global warming. He wants the PIF nations to agree on a “Majuro Declaration”, which involves adopting concrete measures on issues such as reducing emissions and adopting renewable energy. The plan is to then present the declaration to UN Secretary General Ban Ki-moon at the General Assembly meeting in New York at the end of September and push the rest of the world to follow its example. While climate change is the central theme of the four-day summit, a raft of other issues will be discussed by the island leaders and dialogue partners attending the event, including diplomats from the United States, China, the European Union, India and Russia. These include sustainable development, increasing islanders’ control of the $4.0 billion a year Pacific tuna industry, and whether to re-admit Fiji, which was expelled in 2009 in the wake of a military coup.